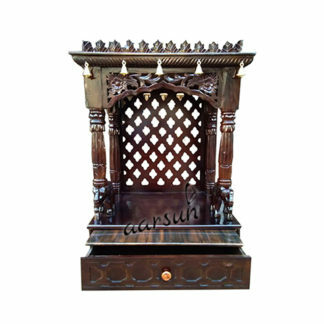 The temple is in Sheesham Wood except for the base where idols are to be placed and the ceiling where dome is placed which is in premium quality plywood.The temple is mounted on circular piers. At the base there is drawer along with sliding tray for puja essentials like rosewater,matchsticks,incense sticks etc.Above that there are two carved pillars at the front of the temple and afterward there is main place for the deity with wooden jaali design at the back and at the side of the temple.At the roof top there is three domes with shikhara at the top. There is holy word “OM” written over there along with beautiful carving. 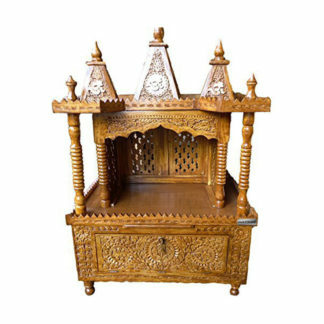 The temple is best suitable for home and office purpose.As we are the manufacturers so customizations are available as per the need of the customer.We provide free shipping across India.